← Building Blocks: Are These Just Toys or Educational Items? As the preschooler’s second parent, teachers also put their children’s best interests at heart. This is the value we always impress to our highly qualified educators as we provide quality child care services in Anaheim, California. We believe that your child deserves quality results when it comes to their learning because we know that this is what you want for them to achieve. 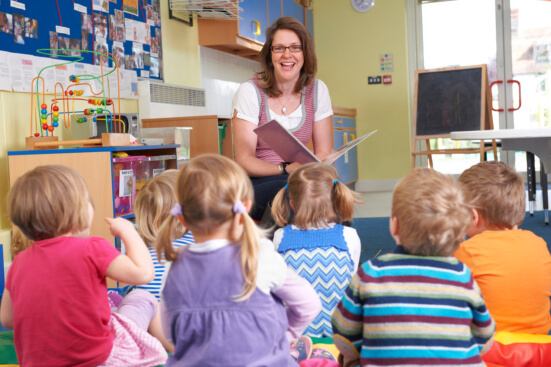 Hence, we employ and design many creative programs and activities to ensure that the learning experience of our children in Happy Hearts Preschool and Childcare is quality and lifelong. With this, we advocate the strategy of storytelling to children. Looking closer, how is your child truly rewarded with diligent storytelling? Let us give you this quick preview. Children learn to appreciate other cultures. In this so-called “click” generation, people from all nations can quickly come together just with a click of the mouse or tap of the finger. Thanks to technology for that! Hence, they better be prepared in these instances and hearing stories from other places can give them an outlook for that. When they’re able to appreciate another child’s culture, they will learn to respect and embrace each other’s differences. Children learn to accept their own roots. It’s not too early to tell a child their ethnic origins. However, they may not be able to grasp the depths of it. With storytelling, they can have a creative approach to understanding where they come from and appreciate their roots. This level of acceptance can do wonders to them as they grow up. Children learn to easily empathize. When the child is exposed to the fact that people are different and this difference should be respected, they can easily exercise empathy in others who are in a new place, or they would know what to feel when they’re in a new situation. They can achieve this kind of orientation with quality storytelling. Children learn about other traditions and values. Respecting the traditions of other people enables the child to enjoy the company of others no matter the difference. This also keeps them from pronouncing unhealthy judgments which won’t foster good and healthy relationships. The more that children listen to stories from other places, the more they will see that no matter the geographical or traditional gap, people still share a common value on love, wisdom, and peace. When they appreciate these similarities, they can work out highlighting these as they grow up, helping themselves to be better individuals. Learning about the deep joys of teaching can be acquired at home through the habit of storytelling. As a leading child care provider in Anaheim, California, we advocate for the practice of creative and diverse storytelling to your little ones at home. You can integrate this in their daily routines, such as right before bedtime, so the rewards of creative storytelling can be planted early on. Has this post inspired you? Forward to a friend by clicking SHARE! This entry was posted in Child Development and tagged Creative Programs, Exercise Empathy, Storytelling, Traditions and Values. Bookmark the permalink.